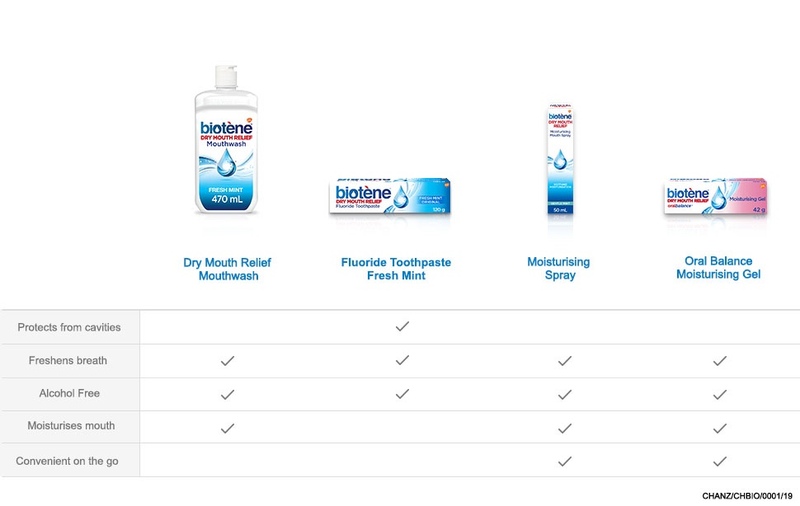 Biotene Oral Balance Moisturising Gel for dry mouth relief helps soothe & protect oral tissues. Biotene Oral Balance long-lasting gel helps soothe and protect a dry mouth against discomfort. Contains a mouth moisturising system to help relieve a dry mouth. If you suffer from a dry mouth you may be experiencing some of these problems. Dry mouth is commonly associated with the use of medications. Many medications may cause a dry mouth. Do not use: Not for use by children 12 years and under unless directed by a doctor or dentist. Do not use if allergic to any of the ingredients. Use within 60 days of opening. Should symptoms persists, consult a doctor. Keep out of reach of children. Caton ends are sealed. Do not use if seals are broken. Glycerin, Water, Sorbitol, Xylitol, Carbomer, Hydroxyethylcellulose, Sodium Hydroxide. Apply Biotene oral balance Dry Mouth Moisturising Gel as often as needed for relief. Place 1-2cm of the gel directly on the tongue and spread thoroughly inside the mouth. Use as required or as directed by your dentist or doctor. Close cap after use to protect contents from moisture. Biotene Oral Balance Gel 42g is rated 4.4 out of 5 by 9.